I am currently curled up on a sofa in Germany, with rain pelting the windows and nothing at all tempting me to go outside. I am in the final days of my variety show season here, which marks the end of 24 weeks in a row of touring my Strong Lady show. It began with a long and wonderful tour of outdoor arts festivals in the UK, Europe and America – then, from my last gig of the summer, I flew here to begin this 10 week variety season. The buckets of sunshine through the summer and autumn made this tour one of my favourites in the 16 years that I have been touring internationally – I am walking out of this epic tour feeling surprisingly strong: my body and my mind both in good shape. Yay! When I finish here I’m having 2 weeks off – then the next adventure begins! I am a tingly mix of excited and nervous about what is around the corner. 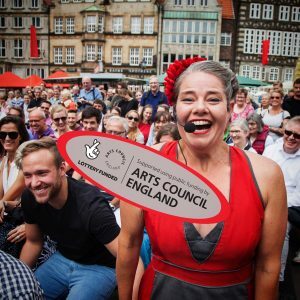 During the summer tour I was THRILLED to get the news that I had been offered Arts Council England’s new funding for Developing Your Creative Practice (DYCP). This remarkable award is designed specifically for independent artists – like me – to identify how they want to grow and help them to do it. So, you ask… what is next for this Strong Lady? I am going to work with a series of different collaborators, to develop more skills in creating work from a starting point of story (rather than from a list of tricks) and to expand my physical vocabulary for storytelling. This will enable me to create new outdoor festival shows with more complex narratives and also begin creating work for touring theatres as well. I am so grateful for the support of the Arts Council England in making it possible and for the support of Metal Southend and the Drill Hall in Great Yarmouth for giving me time and space in residencies. I haven’t locked it all down yet, but collaborators so far include: Joyce Henderson (Complicite), Charlotte Mooney (Ockham’s Razor) and Jess Love for exploring devising methods. Object animation skill development with Mervyn Millar (Significant Object), also exploring possibilities in dance and movement with Anthony Missen (Company Chameleon). This DYCP project doesn’t have any set outcome. I will finish my residencies with a showing of some of what has been explored, but I hope that this research will form the foundations for my next show: POWER. I plan to create POWER for touring in 2020 as both an indoor theatre show and a new outdoor arts festival piece. Throughout the 2018 summer tour I was collecting interviews with people all around the UK, and especially in my home base of Essex. There was a remarkable common thread – everyone who I asked to tell me about an experience they had of feeling strong or powerful would begin by saying something along the lines of “I wouldn’t have a story like that”. It only took a little probing and a handful of ‘umms’ and ‘ahs’ before a rich story would unfold. This connection with people was inspiring – seeing the change in people as they both reframed their experience as a moment of strength and felt the impact of being listened to. This reaction highlighted my own resistance to making autobiographical work and the feeling that telling my own story was somehow either indulgent or frivolous. A strange perspective when most of my favourite theatrical experiences are of very personal stories being told. My performance style is very honest, open and connected to the audience – I am excited to see how this can evolve to sharing more personal stories. The interviews and my own stories will give us something to explore on the floor with different collaborators, to practice putting techniques into action. Already, there are interesting connections building between these stories and I hope to play with using the recordings of the voices from the interviews as part of the soundtrack for physical choreography. I loved the interviewing experience, so plan to keep developing my interview technique and continue gathering more stories. As I have researched different ways of structuring stories, it has made me see how I could craft my questions differently to draw out richer details of the journey people are recounting. Also, the process of listening back to the interviews to transcribe them has helped me to see some glitches in my technique that will be easily remedied. The first of three residencies will be a two week stretch at Metal Southend, in early December. This residency will focus mostly on techniques for devising and creating work, exploring stories and the evolution of an interesting idea to an engaging performance. While in Germany for this variety season I have been preparing for the upcoming residencies. Around my fairly hefty show schedule, I have been: researching story structure, transcribing the interviews I collected, and contemplating parts of my own story that I’m interested in telling. I have been looking at connections/juxtapositions between the stories I have on the table and trying to find ways of documenting and keeping note of all the ideas that pop up as the stories marinate. I have also been playing with making soundtracks out of vocal clips from the interviews. I’ve had the luxury of access to the theatre space before shows for training skills I might want to include and to explore some of the ideas on the floor. I had my first session with a collaborator while I have been here, in the form of almost 4 hours on Skype with Charlotte Mooney (Ockham’s Razor). We worked on techniques for investigating an idea on paper and then how to move the exploration off paper and onto the floor. Following through on this conversation resulted in me and a pile of books in front of a video camera for an hour, without ever running out of ideas to play with and images to create. As someone who is very easily trapped on paper and in cerebral concepts with no way to open the door to making it a physical thing that is visually entertaining – this was a breakthrough. I am very excited to work with her in person for a couple of days soon. During these last days in Germany, I am busy wrapping up my thoughts so far to be ready to begin my first residency in the UK. I am trying to collate ideas, finalise some bits of sound editing I’ve dabbled in, film bits of material I have dreamed up and physical vocabulary I have been working on. 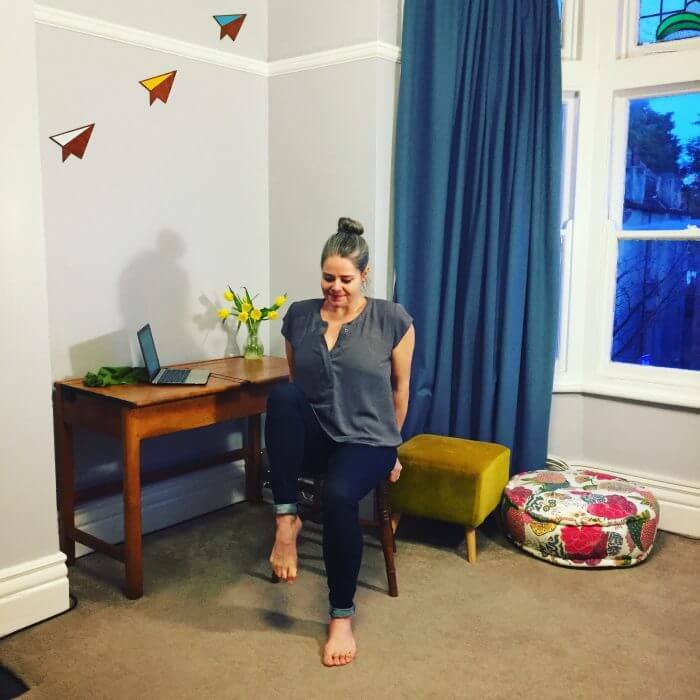 I am trying not to get carried away by my tendency to being prepared, organised and overworked… trying to cultivate a bit of balance with curiosity, openness and not knowing yet. Phase 3: The first residency! I am not sure who will read this… but for the sake of my own reflection, if nothing else, I will report back later in the year with news about how things unfold in the next step of this big adventure. Please pop yourself over to instagram and follow me there (strongladyproductions) to see glimpses of stuff as it happens! Until then, be lovely to yourself and the people who cross your path and hopefully see you somewhere soon. There have been many times after my shows that people (mostly kids, sometimes grown ups) have asked how they can get stronger… I started to write this for one such little girl, then thought that you might like to read it too. I hope you find something in here that makes you feel excited to move more and shine strong. This is not about achieving strength… it is about growing stronger. There is no destination you arrive to where you tick the box and are now officially strong, it’s just a process of changing and growing and choosing what next. There is always a choice that you can make right now to grow a little bit stronger, enjoy it. When we feel bad about how our body is now, it doesn’t make us get stronger faster, it slows us down. We can never hate ourselves into being any kind of better. Instead, if we can practice loving our bodies exactly as they are already and being grateful for the amazing things that are possible with this body, then we will find all our training is way more potent. I learned from my friend Reuben DotDotDot (who trains better than anyone I know) that you should approach getting stronger as training rather than as exercise. Don’t just blindly go from machine to machine at the gym to fill an amount of time, exercising because you know you should. Training means choosing a goal to work towards, something specific that you think would be fun to do like: holding a handstand; or being able to cross the monkey bars; or lifting a man into the air. Then you figure out what things need strengthening to do that, then you make a plan. When we train with purpose rather than blindly ‘exercise’ we enter approach mode (moving toward something we want) which is energising and motivating, rather than into avoidance mode (moving away from something we don’t want) which causes stress and slows your journey of growing stronger. The fastest way to develop strength is through training every day – make yourself some short training sequences or flows that you can realistically fit in every day. It is much more effective to do 10 or 20 minutes a day of focused training than 2 hours once a month! 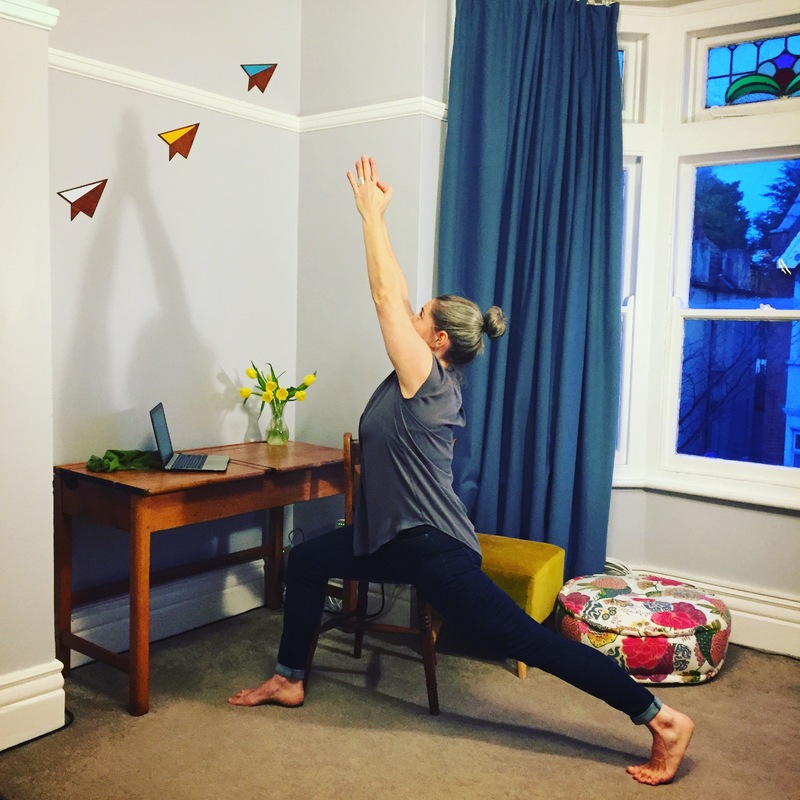 Going to classes like yoga, pilates, crossfit or heading to a gym are all great, but you can also train really effectively with just your own body in your own home if that will make it easier to build the habit. Our habits are a big part of who we are, if you create a habit of training you quickly become a stronger person. Creating a habit takes effort, but the beauty of habit is that once it is established, it takes very little effort to keep going. So for the first few weeks of training every day, you are just working to establish the habit, so make it easy on yourself… make it a short session, put on nice music, pat yourself on the back afterward. The key is to make it daily (or at least on set days), so that it can become a habit. A little bit of focused movement every day will sometimes turn into a big session – but it is the consistency that powers it. If our goal is something we can’t do yet, break it down to smaller steps that you can repeat over and over to train your body to move in the way it needs to – these reps will help to create neural pathways in the brain (habits of moving), which will make that complex movements automatic over time. 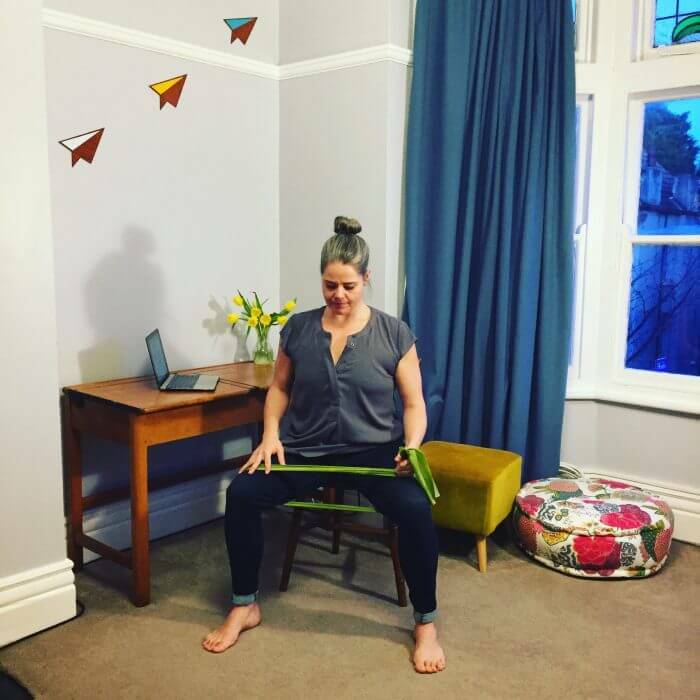 Most goals that have something to do with strength rely on having good core activation (the deep muscles of the torso including the pelvic floor, TA and psoas). Sit-ups are not the answer! They train your six pack, but don’t really help very much with doing any fun tricks. 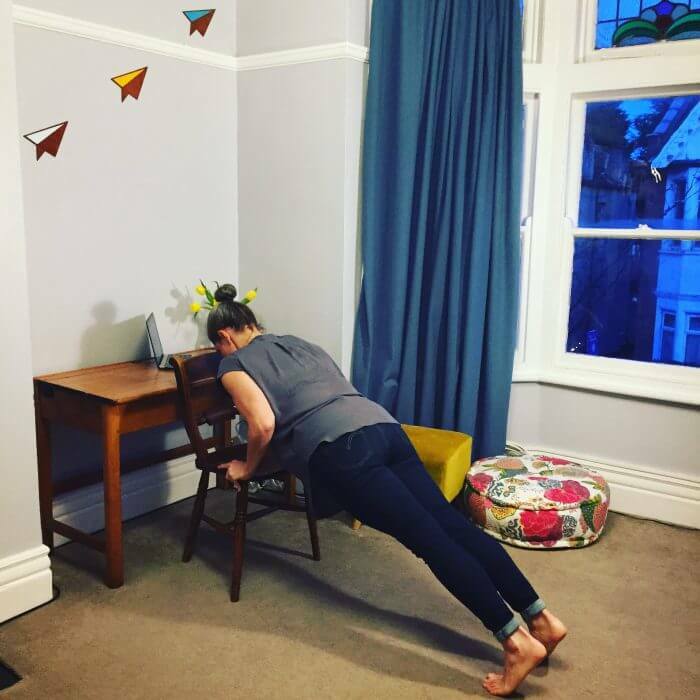 There are loads of great core training exercises in yoga and pilates… the simplest way is to start planking. 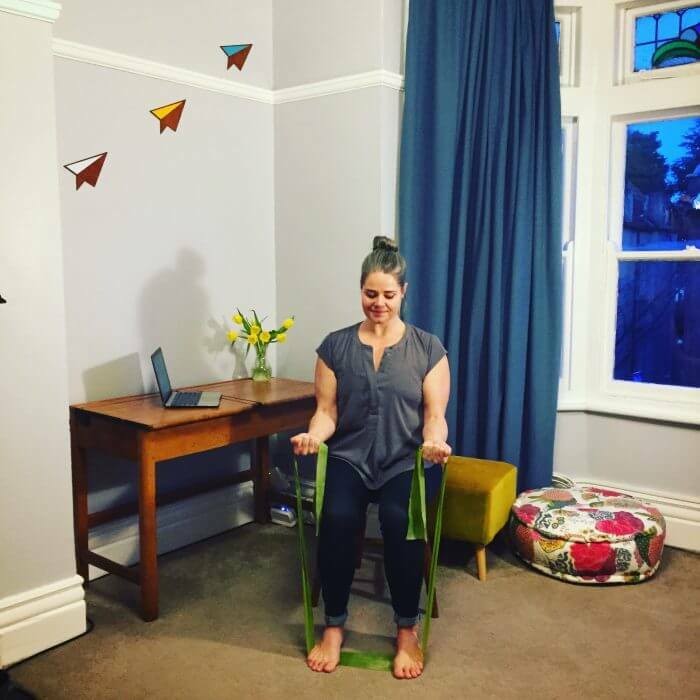 press the floor away with your hands strongly and let the shoulder blades wrap around the side of the ribs, trying to make a rainbow shape between the shoulders. This is protraction of the shoulders. you also want to try to externally rotate from the shoulders: shoulder head wrapping back away from the ears and think of trying to use your shoulder to wrap the bicep around the outside of the arm. try not to sag in the hips, make a straight line between your shoulders, hips and heels. engage the core by lifting the lower belly and imagine the feeling of a wide belt tightening around the waist – also think of all the muscles of the front of the body lifting to press into all the muscles of the back of the body – and at the same time all the back muscles of the body press back into the front body. One of the keys to getting stronger and avoiding injury is to find a balance between repeating exercises to get more skilled at them and also doing lots of different things so that your body moves in lots of different ways. There are online tutorials about yoga, primal movement play and pilates which all are great. Also, just putting on music and dancing your heart out, moving in as many ways as you can for 5 or 10 min is wonderful. Or go to the park and run, jump, climb, roll around. How we use our mind when we train is important. It helps us get stronger faster if we focus our attention carefully on technique and whats happening in the body while we train, this can even become a part of a mindfulness practice, like a moving meditation. We can use the time where we train our muscles to train or mind as well. If we practice focusing our attention what we are working towards in a hopeful way, rather than on criticising ourselves or others while we train, then we strengthen a habit of thinking (neural pathway) which is kind to ourselves and in approach mode – it will spill over into the rest of the day. Side note… the mind is amazing! When you visualise doing something or imagine feeling it, it fires in the brain the same as if you really did it or felt it. So you can keep working on the technique of a skill even when you can’t physically do it by visualising. 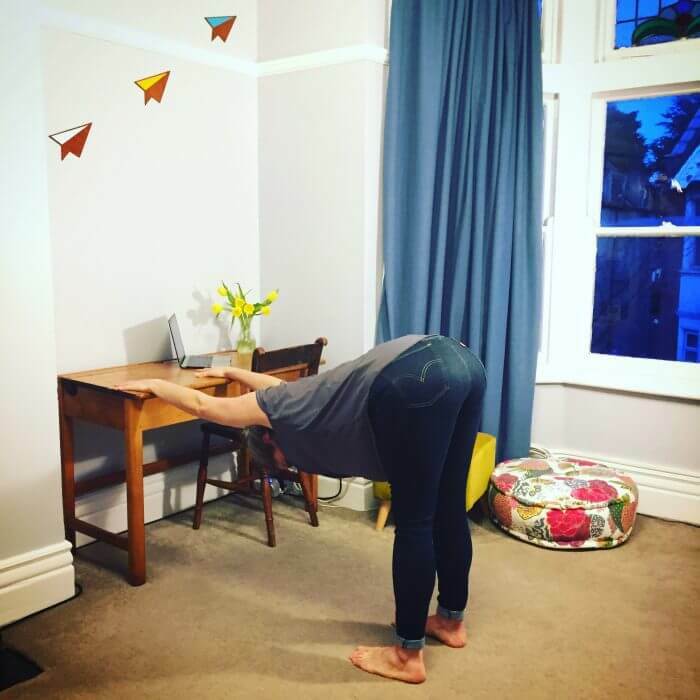 Also, you can practice feeling strong and amazing, even if you aren’t quite convinced yet…. and it will become easier to feel that way. We can sometimes get caught up busily trying to achieve all the time and our bodies get inflamed, using all it’s energy surviving and not on digesting, healing, or growing stronger… part of getting stronger is rest and recovery time. This can be savasana in yoga (the laying down bit at the end), or resting between sets of exercises, or having a good night sleep. Even after a weights session at the gym I like to take a few minutes to sit and do a breathing meditation to guide my body into recovery. One great ‘hack’ is to do this 1:2 breathing exercise for a minute or more after you train to recover and help your body go into rest mode (stimulating the Parasympathetic nervous system). 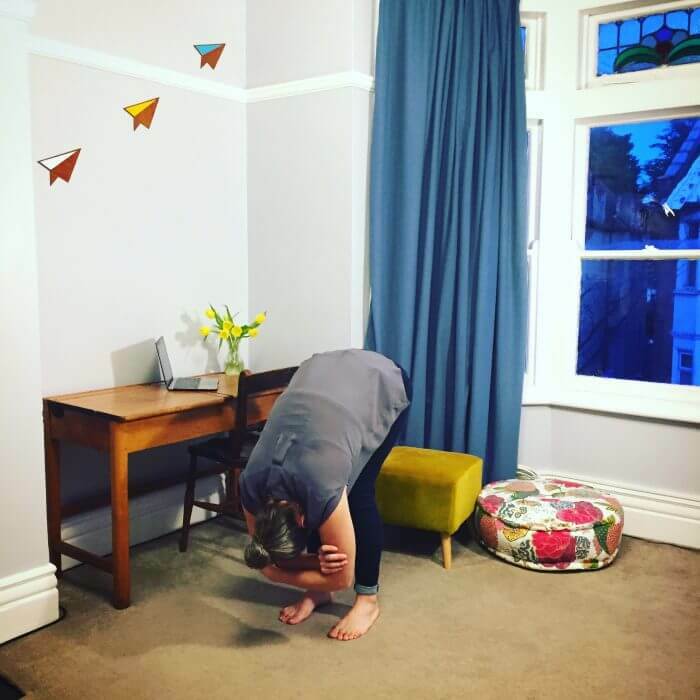 start to breathe so that your exhale becomes twice as long as the inhale (perhaps in for 4 out for 8, or in for 5 out for 10) Try work with a length that is comfortable and you aren’t going to strain. Developing mental strength is just as much a part of being a Strong Lady (or strong man) as developing your biceps. Just like you develop muscular strength with regular training sessions, it is our habits and daily practices that act as ‘gym sessions’ for growing our mental strength. When you have a lifting goal or a big trick that you are working towards, you train drills and repetitions of the technique without the full weight. This is to be sure that, in the moment of full strain, you have both the power you need and the correct alignment to keep it safe… In terms of mental strength, when we repeat any action, thought sequence or behavior, it creates a neural pathway in the brain. Every time it is repeated it becomes stronger, taking less deliberate energy to repeat next time (or more energy and focus to change). We can best break unhealthy habits (or neural pathways) by deliberately repeating the habit that we want to replace them with. While it will take considerable effort to begin with, the habit will become easier to continue as the pathway becomes stronger. In times where you are calm and energised, do the work of developing better habits through repetition, so that when you are stressed you will instinctively do the things that spiral you up, not down. We can not control what happens around us, or even what thoughts pop up in our mind – but we can choose where to focus our attention. Love, fun, appreciation and admiration are all part of gratitude. Scientific research suggests that a daily gratitude habit, such as keeping a gratitude journal or taking a daily photo of something we find beautiful, activates the approach system of the brain. This increases energy and happiness levels, as well as boosting the immune system and even relieving physical pain. The mind has a negative bias built into it’s survival mechanism, so it takes a conscious choice and repeated effort to train the mind to prioitise things that we want to see, as it scans the horizon. We don’t need to put a silver lining on things that need to change, or that upset us – but in any scene we can cast our focus on something that feels better – actively seeking things to focus on that feel good. I was recently in an airport travelling home from an international gig. The flight was delayed by five hours, I was feeling sick and ended up spending much of those 5 hours vomiting in the airport toilets, my phone ran out of battery and I was lonely. It was not fun. But I found considerable relief by repeatedly scanning the situation for what I could feel good about: that the vomiting hit when it did and not on the flight, that there was a comfortable seat by the window where I could watch the clouds, that the cleaning staff in the bathroom looked at me kindly and that I was going to feel better eventually. I’m going to write a whole thing about this soon… so for now I will just say that I am finding a daily meditation practice one of the most powerful things I’ve ever done to grow my ‘mental-muscle’ and increase my enjoyment of life. Make choices, be clear and take action. It doesn’t need to be the perfect decision (or even a big decision) just choose things every day. Making decisions is a quick way to relieve anxiety and release chemicals in the brain that make us feel energized and optimistic. No one responds well to feeling trapped or a to a pile of ‘should’ and ‘have-to’. By making choices we answer our desire for freedom and power over our lives. Choose always FOR what you DO want, rather than against what you don’t want. It’s the difference between “I want to be strong enough to safely do this trick” as a starting point for training, rather than “I don’t want to hurt myself trying this trick”. The mind has a complex filter system that will show you more of what you are focusing on. When we choose finding the solution rather than solving the problem, we see opportunities much faster. Move your body in a way that feels fun EVERY day. It doesn’t need to be the gym, even a little walk is great, especially if you can find somewhere pretty or in nature. For me, I always seek out spots near water. The impact that exercise has on the brain is immense, releasing many of the same chemicals as antidepressants or other drugs, without any side effects. If you are trying to control your emotions under stress, to lift your mood or to resist temptation, then a moment of exercise before you take action will put you in a stronger mental state. Some tips on getting the most neurological benefit from your exercise include: making it feel fun and voluntary; exercise that causes variation in your heart rate; writing out a plan and ticking it off; visualising what you are aiming for while exercising; exercising in beautiful surroundings; and exercise that has a social element. The brain and the body influence each other in a bio-feedback loop. Strong emotions cause physical reactions (eg. tensing of facial muscles if we are stressed). Likewise, if we adjust our physical state, it creates changes in the brain (eg. relaxing the muscles of the face to calm the mind). The brain reacts in the same way when we smile and laugh, whether it is triggered by something pleasing or if you ‘fake’ it, so either way is will start an upward spiral. Smiling, laughing, adopting upright open posture, slowing breathing or relaxing the face and other muscles are all good ways to reduce stress levels and increase happiness. Regular massage and yoga practice are also scientifically proven ways to feel more content and at peace. Go on… Smile, for no reason at all… make the biofeedback loop work for you. The European summer is approaching, and with it a delightful array of festivals in different towns, in different countries… and in different languages. In my opinion, when you arrive to a place where they speak a different language to you, it is polite to be equipped with at least a handful of words and phrases in their language, even if you are pretty sure that most people will be able to talk with you in English. Below are a few phrases that you won’t find in regular phrasebooks, specifically useful for arriving to a festival and getting set up for a show. The phrases below are written in English then translated to German first, French second. The translations were done with the help of a brilliant aerialist I have been working with Kaleen McKeeman – an American artist who has become startlingly fluent in both French and German. Hi I am (name) from (company/show). Where can I put my things? Wo kan ich miene Sachen hinstellen? Ou est-ce que je peux deposer mes affaires? Is my stuff safe here overnight? Sind meine Sachen hier nachts sicher? Est-ce que mes affaires sont securitaires pendant la nuit? Ou est-ce que je peux stationer mon auto? Avec qui je devrais parler pour …. Can I test the sound system? Kann ich bitte einen Soundcheck machen? Est-ce que je peux tester le son? Kann ich bitte …. benutzen? Est-ce que je peux utiliser ….? What time should I start/end? Wann soll die Show beginnen/beenden? Quand est-ce que je dois commencer/finir le spectacle? Koennen Sie mir bitte damit helfen? Est-ce que vous pouvez m’aider avec ca? I don’t need any help, thanks. Kann ich dir damit helfen? Est-ce que vous voulez assistence avec ca? When do the public arrive? Quand est-ce que le public arrive? Est-ce que vous etes pret? Kann ich bitte Trinkwasser haben? Est-ce que je peux avoir de l’eau? Haben Sie etwas Gluten-freies / Vegetarisches? Est-ce qu’il y a quelque chose sans gluten / vegeterienne? There is a wonderful culture of outdoor arts and street theatre festivals in the UK and Europe and I have been lucky enough to be part of it, with various shows, for the last 13 years. Showcase festivals are one of the best ways to get your tours rolling. Many of the best festivals on this landscape will only book shows that the producers have seen live, with their own eyes, or at least heard about from someone they trust who has themselves seen your work. This is where it becomes exceptionally valuable to take part in showcase festivals. You can, of course, begin instead by touring to festivals who will book from promo materials and then invite people to see you there – but as festival producers tend to be stretched thin already, the number of festivals they can attend in any summer is limited, so they are more likely to take the time out for a showcase festival where they can see many new works in one place. I thought that it may be useful if I compiled a list of the best showcase festivals I know of for working in Europe… I have not attended them all, but have at least heard good things about them. One word of advice from someone who learned the hard way though… be sure that your show is well developed and ready before you go to a showcase… I took a show to one of these festivals too early and it took years to convince some producers to take a second look once the show had developed. Also (though I have never had the chance to do it myself) I have often seen people take an extra person with them to these festivals as a representative… While you are busy preparing for and doing shows, it can be great to have someone who is free to talk with people who come to see the show. I am rather consumed by injury prevention just now. I am about to turn 36 and 2015 has turned into a very full year of shows (including a gloriously packed tour of my new show LEAP, which is more physically demanding than anything I have done before) – I intend to arrive at the end of this year in one piece, injury-free and healthy. I’m doing lots of work to increase my strength and have been researching into injury prevention. 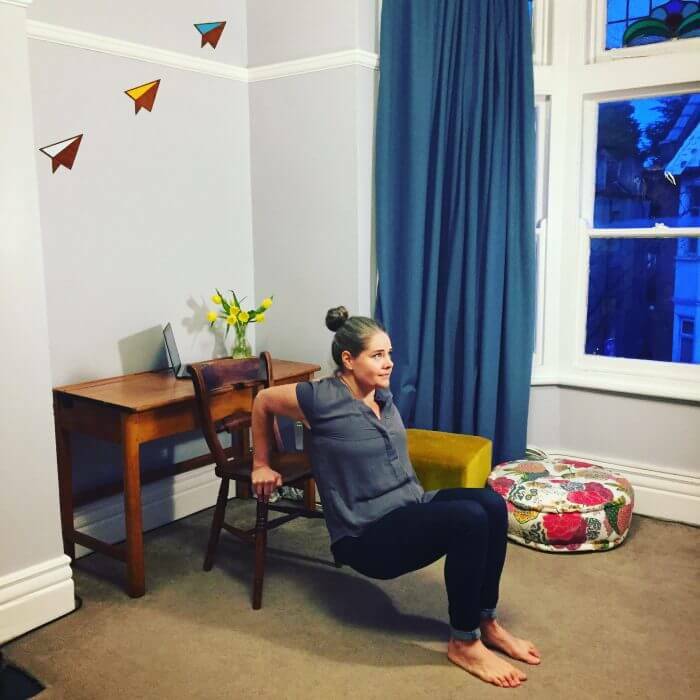 This is a summary of some of the brilliant advice and info I have come across in my quest to be a Strong Lady free from injury and in perfect working order. When I began touring my Strong Lady show back in 2006, there were many voices telling me that the Human Carousel (where i lift 2 men at once and spin them around) was only going to be possible for me for a couple of years at best before injury would strike my back. They made me scared and so I sought advice – core strength and keeping my back supple were the key, I was told. Almost 10 years later and my Osteo says my back is in better shape than it was back then, thanks I am guessing, to the Pilates and Yoga combo that was recommended to me at the outset. The new show, LEAP is a duo acrobatic show which includes hand-to-hand and perch, where I am basing a man of between 60 and 65kg. My shoulders are the most vulnerable site for injury in this show, so I have been working with a few wonderful experts in different parts of the world to keep them healthy. 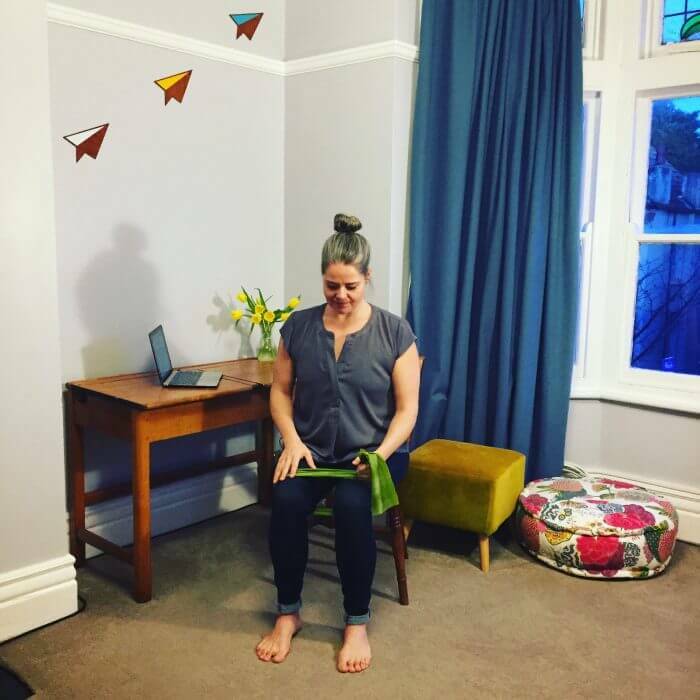 When I worked briefly with Mimbre a few years ago, they introduced me to the very enlightened practice of going to a physio at the start of a new project to talk about the specific physical movements you would be working on, having them analyse your body with those movements in mind and then advise you on what you needed to do to keep your body safe. Sometimes this has been tips on how to execute the movement, sometimes exercises to correct restrictions in your movement or to increase strength or flexibility in certain areas that are deficient for what this new movement will need. For this process I rely on James at Perform Health in London, as he is a physical performance specialist. Small enough to have one with you anywhere you go, these things are magic. When we train, we can get so busy building strength in the big muscles and chasing increases in weights, that we forget to train the stabilisers. For me, I was particularly lax in the engagement of my sub-scapularis muscles (the ones that draw your shoulder blades in and down). 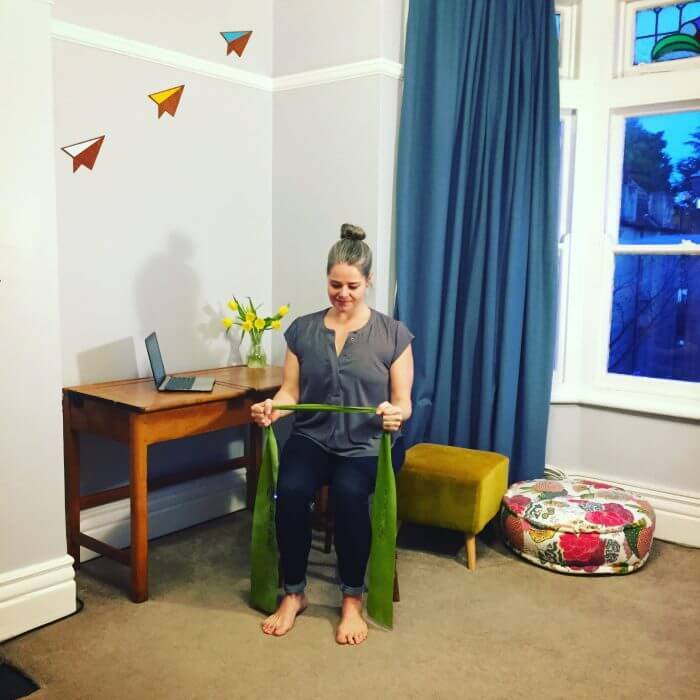 I have now got a series of theraband exercises that I try to do for 15-20min / 3 or 4 times a day. I always use them as part of my warmup before training strength or doing shows. from this position do whatever movement you are doing, always beginning the movement from the shoulder blades. 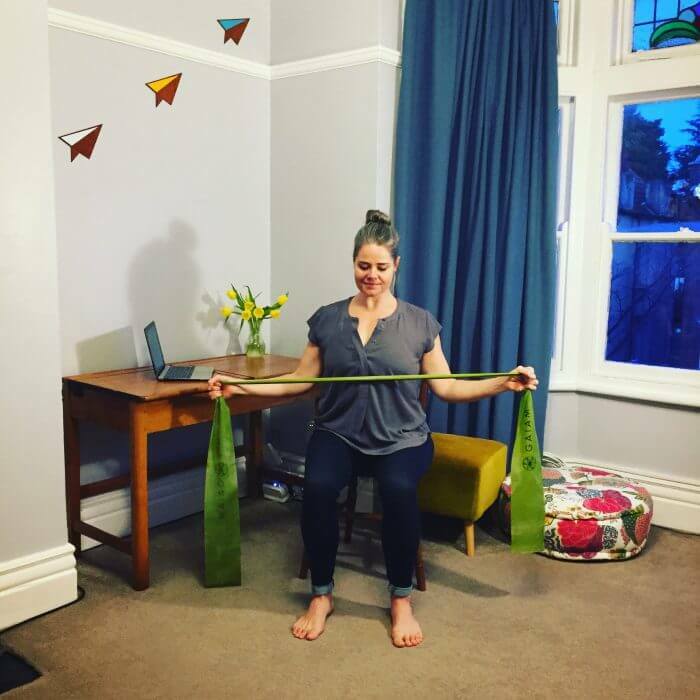 I have been amazed at how powerful an impact ‘fascia release’ has on clearing pain, increasing agility and increasing my access to my strength. 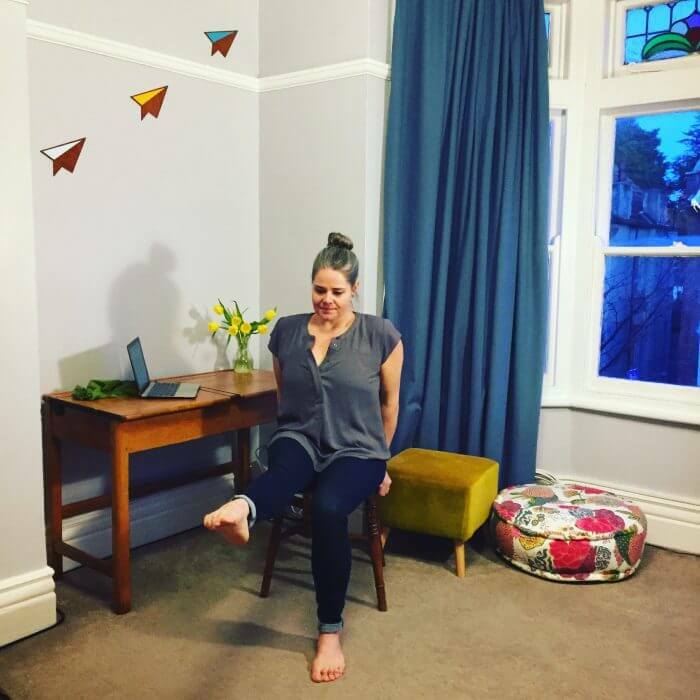 I am not an expert and intend to research this more… I have recently been seeing a physio who specialises in this and his results are so fast. Until I understand it more I will say only that it is a connective tissue, a kind of film that encases every structure in the body, including muscles. The theory is that it can get kinks, twists and hernias in it which then result in stiffness, muscle tightness and pain. In the case of the shoulders, it can cause you to move in imperfect ways which put the joint at risk. To me it seems, again, like magic. Obvious when you say it, but I was not doing it… Basically, when training strength I was only mimicking the movements I needed for the skills I was performing, but with a dumbbell where a person would be… this is not perfect. I have been advised that I need to balance all my weights training by performing the opposite movement as well. Not only does this keep you from injury related to dispropotionate opposing muscles, but also gives you loads more power in the original movement as you have stability behind it. chest press with dumbbells / rows that mimic the movement in reverse or hang under a low bar in a plank with your feet walked out so you can do a kind of chest to bar pull up that mimics the movement. also as I spend much of my work time in compression, it is important to spans some time in extension… hanging from a bar overhead for example. Another means of keeping balanced in my training is to mostly avoid using machines for weights and stick to free weights (dumbells better than barbells) as you are then incidentally training all the stabilisers as well, rather than the one dimensional tracking of a machine. This is where I have also been advised to be sure to include a balance of body weight exercises as well as the weights, as these tend to lead to more agility and whole body strengthening. The theory here, is that in the extremity of a motion is where our joints (shoulders and knees particularly) are most vulnerable. So the idea is that in training, especially weights training, we should avoid the extremes of the motion in our reps. If the extreme at one end of the motion (eg. a completely straight leg) is 0 and the extreme at the other end of the motion (eg. calf pressed to back of thigh in a deep squat) is 150, then the advice I was given was to only repeat the movement between around 50 and 100. So in terms of squats, you would not fully straighten up or lock you legs when standing and would only take your bottom a little lower than knees in the squatting. In terms of pressing weight overhead, I explained that I needed stability at the extreme of that movement (i.e. arms locked overhead) and was advised that it might be possible to keep a slightly closed shoulder angle in that movement. Also, when it comes to doing weights etc, if you do your reps with a limited range and you can use isometric exercises for the extremes. Isometric exercises are strength training where the angle of the joint and length of the muscle don’t change during the exercise. Essentially you are exerting pressure, while holding the position. This is what was recommended to me for the extreme ends of the movements that I will limit to mid-range motion (above), and is also useful if you are trying to train or warmup in a restricted amount of space. As I collect Isometric exercises I will make another post with a long list… for now, the main way I will use this is in training the extremes of motion for overhead press and for deep squats. also for overhead press, I imagine (making this up myself) that handstands against the wall for time are probably good too. for deep squats I will set a timer to ping at regular intervals (e.g. 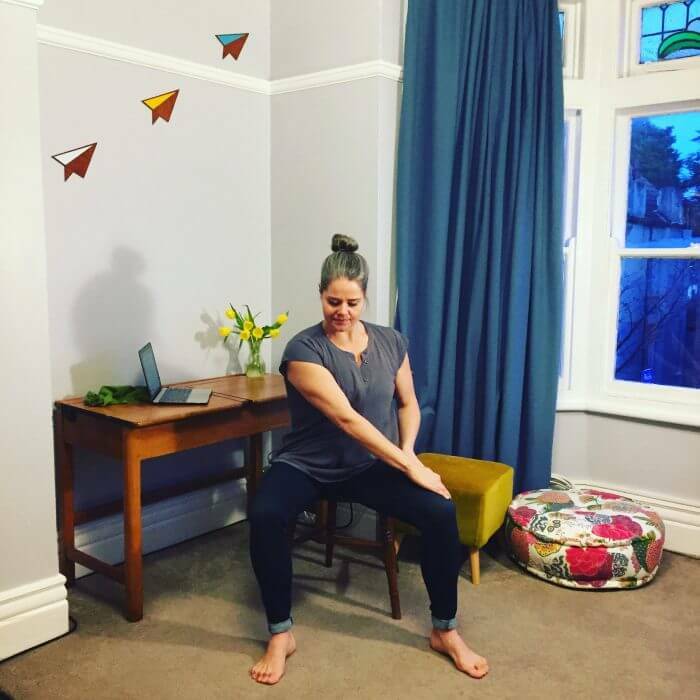 1min), then squat as deep as I can (without my thigh resting onto my calf, so that it is active) and hold for time, then raise slightly and hold the new position for time, then repeat until 90 degrees. 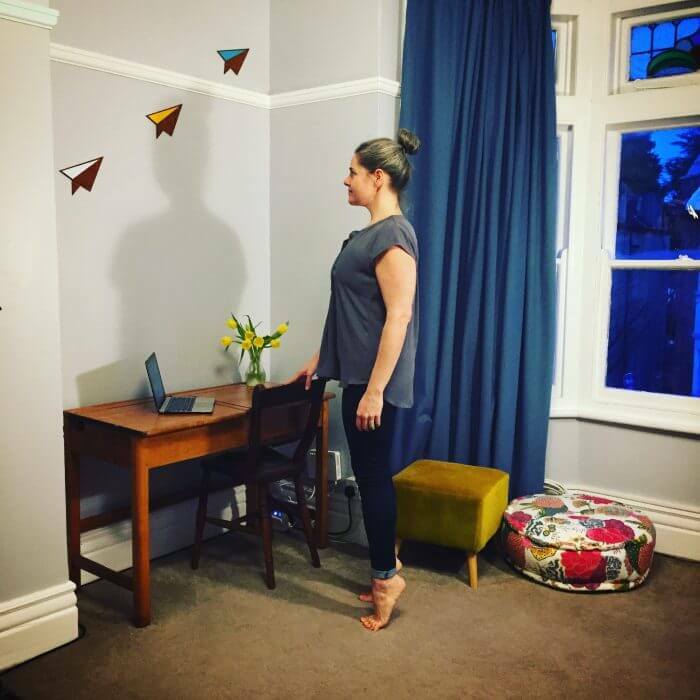 Stand with one side of the body against the wall – the leg that is against the wall raise up so the knee and hip both have 90 degree angles – firmly press the balancing foot into the floor and firmly press the being leg into the wall – hold for time – repeat. Wall-angels. (It has movement, so not sure it is technically iso-metric, but found it when researching isometric… so I will continue the fallacy.) 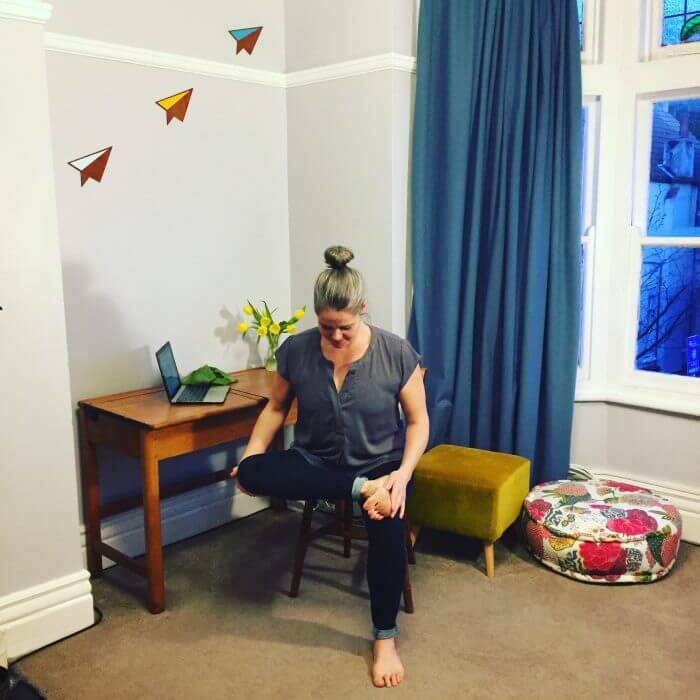 Go into a 90degree knee squat with back against the wall – press back firmly into the wall – hold backs of the arms against the wall with hands at about head height and elbows bent – keeping the entire arm and hand pressed into the wall, raise and lower the arms – this should really engage the scaps. 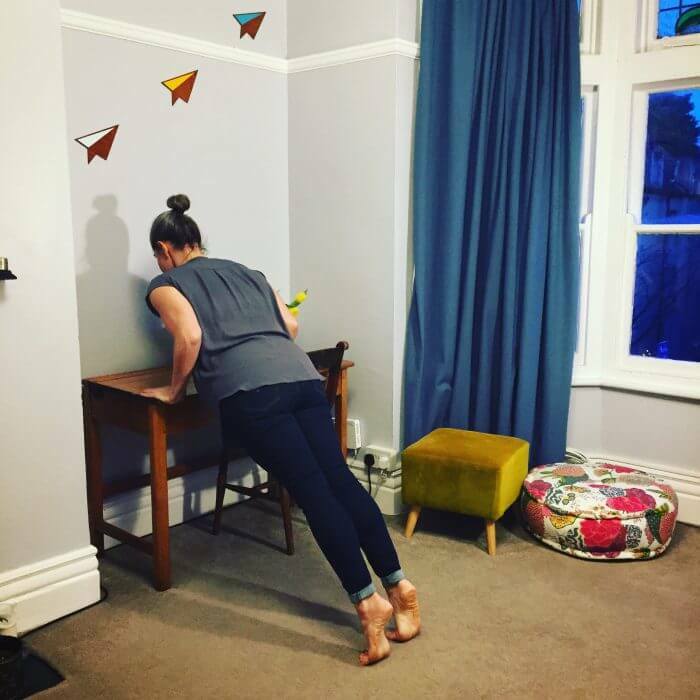 Finally, the importance of developing your proprioceptive skills has been highlighted as very important (though I must say it is usually the first thing to drop out of my training when I am busy, as it really feels like you are doing nothing much). 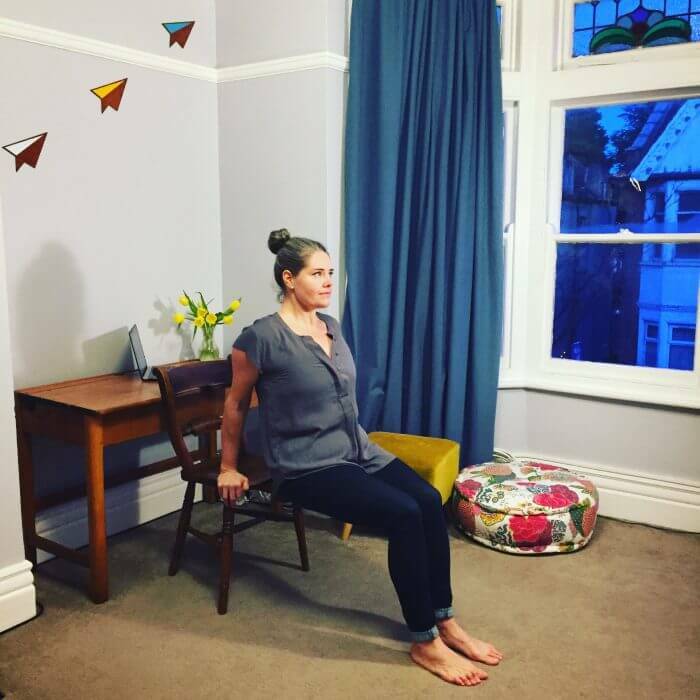 You can find heaps of exercises on google… Basically, these are movements that improve your balance and your sense of where your body is in space… If you are feeling clumsy, these are great to do at the dart of a session to focus your awareness of your body. One plan I have for this blog is to make a note of any places I find on tour – tips on where to eat well and to drink good coffee, see a physio or get a great massage etc… As I write, I am in Bad Oeyenhausen, Germany, on a 2 month contract with the GOP Variete Theatre with their new show BackSTAGE. I am here as spring is just starting to poke through the winter, so it seems to me to be a beautiful, peaceful little town. Most exciting has been the discovery of a Farmer’s Market on Wednesdays! It is just near the corner of Am Kurpark and Herforder Strasse, just beside the beautiful Kurpark (which is where our spectacular theatre lives). There is a fish monger who sells fresh (not been frozen) fish, a selection of which has been line-caught of the coast of Germany and was delicious. There is also a brilliant cheese and charcuterie stand, with meats and cheeses from the local area as well as France and Spain. There’s a well stocked fruit and vegetable stand and a guy selling roasted chickens and a lady selling jams… and a local coffee roasterie set up in a really cute little caravan selling coffee as well as bags of their beans to take home. She is there from 2pm. The coffee was good (not brilliant) and the lady was really lovely. In the Kurpark, at the theatre, there is a restaurant that does an incredible Sunday Brunch. This sauna/spa paradise is incredibly beautiful with intricate attention to detail in the decor. There is a gym and pool area that are both good, but it is when you pass into the Sauna space that things get incredibly peaceful. More than a dozen different sauna/steam room options and a schedule of special offerings through the day including things like salt scrubs, honey scrubs and fresh mint infusions. There are a few separate indoor lounging areas and also outdoor spaces to relax by the pools. They are open until 11pm and once it gets dark the whole place is lit by candles and pretty lamps. A totally rejuvenating and nourishing place to visit. For people who aren’t German or familiar with German saunas, a quick note to save confusion, as no one at the front desk will explain any of this to you: The gym and pool are clothed areas. Once you go into the Sauna area, you don’t wear clothes. Mostly people lounge in bath robes. When in the saunas you take your towel with you and you should make sure that it is under you at any point where you touch the wooden seats (so if sitting you have it under your bum and also your feet, if laying down, you lay on it…). To some people this will seem like an obvious thing to explain… but I was so confused the first time I went to a german spa, so maybe this helps someone. Address: Morsbachallee 5, 32545 Bad Oeynhausen, Germany. This is the best coffee in town, as far as I can tell… It’s not like getting a coffee in Melbourne… but as I am in regional Germany, I am grateful to have found them! If you find yourself here and your body needs a bit of attention – Neils at the REHA-CONCEPT in the Kurpark is amazing. His specialty is Facia Release. So I decided to start a blog… fingers crossed that I have something to say which will be useful to read… I am a touring Strong Lady and I travel most of the year to Outdoor Arts Festivals, Variete-Theatre Venues & Events. I thought it might be nice to write about it a bit. I plan to write about a few different things that I find interesting: Outdoor Arts (festivals, shows, people); Strength (ideas for developing strength physically and mentally); On Tour (I will keep notes on beautiful things to do and great places to eat or get coffee in the towns I tour, also the occasional recipe for hotel-room nourishment). Please like my facebook page HERE for even more bits n bobs or to find out when I am performing near you check out my Tour Dates page. Outdoor Arts – I will write about festivals I visit around the world / My thoughts on performing outdoors / Some of the best shows and most incredible people I encounter along the road. 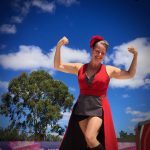 Strength – As a professional Strong Lady, I will share my experiences, ideas and research I find about developing strength, both physical and mental. On Tour – One of the biggest challenges I have faced as a touring performer has been staying healthy on the road. I will write about the best places I find along the way to eat delicious and healthy food (and drink good coffee) so that if you find yourself somewhere I have been, you can eat there too. I may even start popping up some of the best ‘hotel room’ meal recipes I come up with.